Spokeshaved has a mission statement…Its aim is to evolve with care & consideration to its contributors & environment. To grow into an eclectic collection of products with emphasis on detail, engineering & craft. To become an emporium for handcrafted contemporary furniture & sculptural objects manufactured in the U.K.
AM05 Desk – Walnut, Burr Walnut, Leather, Desktop Lino & Copper by Mark Lane. AM05 Desk has been constructed using FSC sourced american black walnut. The desktop is combination of walnut, Forbo Nero desktop linoleum manufactured from renewable, natural raw materials. Basic ingredients include linseed oil, rosin, wood flour & natural pigments, making it biologically degradable & doesn’t harm the environment at any stage of its life. A compartment in the desktop is accessed by an inset Burr walnut veneered lid with an inset black leather belt pull fixed in place with copper nails. The interior of the compartment has been quarter sawn walnut veneered with the same desktop lino base. The exterior of the compartment has 25 to 35 individually sculpted & faceted walnut sections, making each AM05 desk unique. Each AM05 desk is branded discreetly underneath with the Spokeshaved logo & numbered. The desk is completed with a fixed walnut framed black leather satchel with the same copper nail detailing. AM05 stands for Annie Mae, my lovely little girl. TM11 Bedside Table - Fumed oak veneer with solid fumed oak edge bands. 2 No oak dovetailed drawer boxes with Grass Dynapro runners with a magnetic concealed push catch open. Thick solid oak drawer fronts with large radius detail. Solid oak base frame with turned oak leg (unfumed). Finish: Spray lacquer to all fumed oak parts & drawer boxes. Danish oil finish to oak drawer fronts, base frame & legs. Facet - OliveAsh/Oak Sculptural wall mounted square or circular sculptural wall mounted clothes or ornament hanger. The timber is cut to 3 sizes, 60mm, 100mm & 140mm and then faceted on a linisher. Ingot – Square or Circular Sculptural wall mounted clothes or ornament hanger. 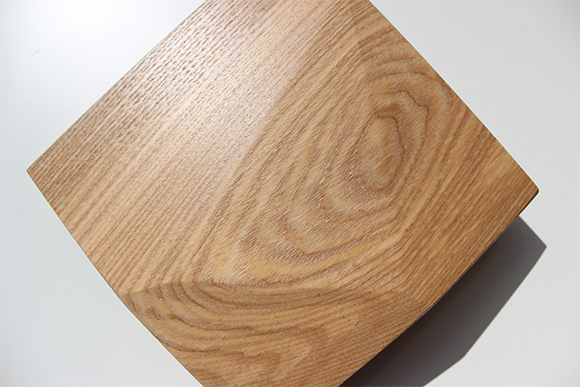 The timber is cut to 3 sizes, 60mm (small), 100mm (medium) & 140mm (Large) and then faceted on a linisher. Then one facet undergoes some rough sawing, mined so to speak, revealing a layer of 22 carat gold leaf. Each has been sprayed in a water based lacquer & each is unique. Great singularly, impressive as a collection.